An expedition to core the Arctic Ocean has uncovered fascinating facets of the Arctic's past over the last 65 million years. What the new research is primarily revealing is how much we have yet to learn. A groundbreaking new analysis of the effects of natural disasters around the world is revealing that the greater the democracy and national income, the lesser the impact of natural disasters on a country. Last austral summer, an international research team met in Antarctica to pull up a core that is revealing much about the last 14 million years in Antarctica. Though human scientists will continue to travel to dangerous and cold corners of the planet to perform research, robotic rovers will increasingly do some of the dirty work. New polar robots are doing just that. Can democracy be tied to the levels of death and destruction caused by a natural disaster? Indonesia mudflow caused by earthquake? Current not responsible for Antarctica's ice? Europe’s Seas on the Brink of Disaster? A new report indicates that Europe’s seas are in bad shape and face growing challenges, thanks to coastal development, overuse of fertilizers, overfishing and other human-induced problems. There is still time to save the seas, however. Our coastlines are being developed at a breakneck pace, despite calls to protect natural systems from scientists. However, researchers have a not-so-secret weapon that helps to convince the public of the error of its ways: geologic hazard maps. Many politicians see linking energy and climate change solutions as a win-win option, but it’s far more complicated than that, as many of the energy independence solutions are contrary to climate change solutions and vice versa. Films about Earth are becoming increasingly popular, as the author realized during visits to some of the world’s finest film festivals. 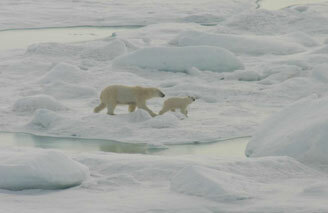 Polar bears are the largest predator in the Arctic, but they are losing ground as the climate changes. 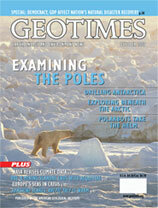 Read more about how the Arctic has changed in the past in this issue. Image is copyright Digital Vision.